Thought I'd share with you my fabulous find, actually my favorite find of the year pretty much. While the BF was away I spent alot of time antique/junk shopping... its one of my favorite things to do, and his least favorite thing to do. Anyway, cut to the point- my FABULOUS find! I felt like screaming winner winner chicken dinner, but instead I did a little happy dance when no one was watching. 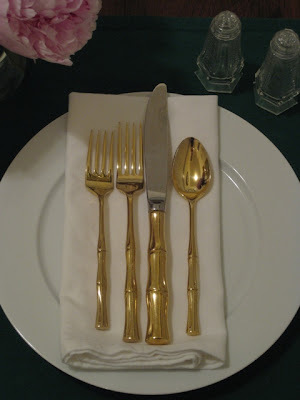 One question for all you out there though, how do you clean gold plated flatware? Some of the pieces have tiny water marks on them and some have little rust spots in the creases and when I tried Wright's Metal Polish (which says its good for gold) it took the gold finish right off- ahhh. Oh and I tried hot soapy water, and not a lemon soap they say that makes them tarnish, and that didn't work either. So, any experts out there- please help! We had that exact pattern in my house growing up...how funny. My grandmother always said that actually using a bit of lemon worked to remove stains on her flatware. Just to make sure that you rinsed immediately and not let the acid soak in...that's when the tarnish starts to happen. Good luck and what a great find! EMAIL ME! I will go antique shopping. I don't think I've ever been real antique shopping, only consignment store type stuff. My mom didn't have the patience for that when we were growing up. oooh, I like these!! How fun! Great, great find!!! It looks fabulous..you lucky girl! Those are beautiful, what a great find! Do you have any special plans to use them soon or will use use them for everyday? 2 of my favourite things in one piece...bamboo & gold. LOVE this set...and service for 12?!?!?!?! lucky you! 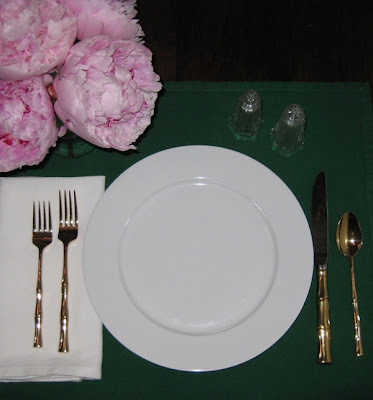 What beautiful flatware! Great find! You have no idea how jealous I am...what a great find! I don't know why sifting through old junk is so calming, but I feel that way too. It's my zen. 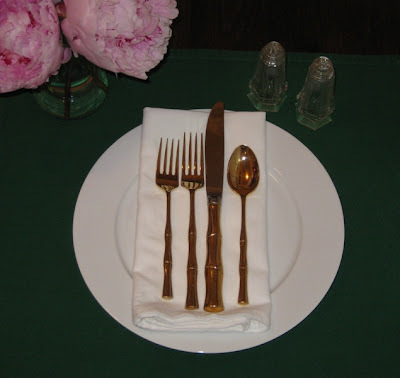 I'm so jealous...do you have ANY idea how desperate I am for a fab silverware/cutlery find...brilliant!! Yay we are silverware twins! I just washed mine in the dishwasher (gutsy, I know) and they turned out perfectly. I'd probably test 1 piece to see if it's ok with yours!